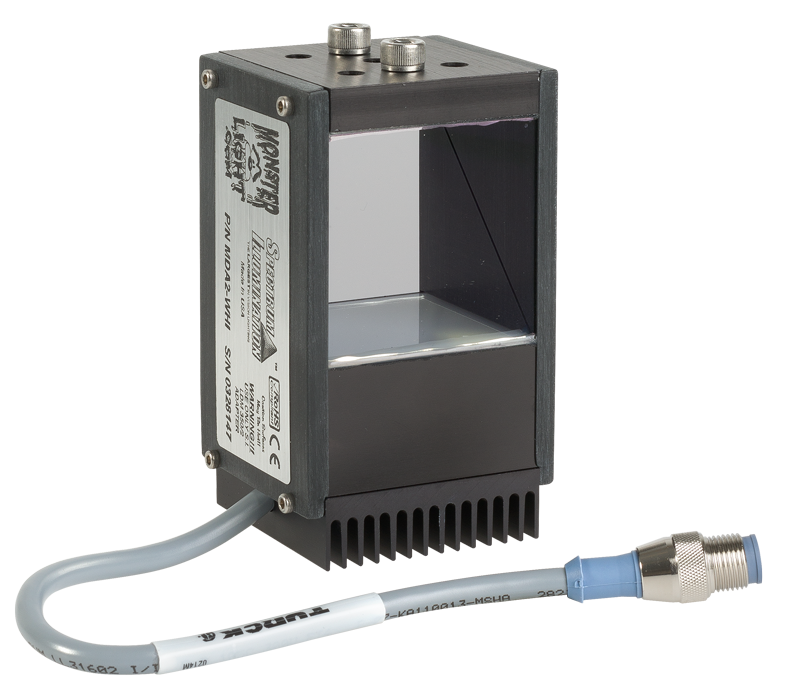 Spectrum Illumination is a premier manufacturer of machine vision lighting products providing a wide range of lighting choices. Lighting can make all the difference in obtaining a good image and making for a successful machine vision application. Spectrum Illumination LED Back Lights come in small 2” x 2” through standard 12” x 12” sizes. Large sizes are also available. Back Lights have hundreds of SMT LED’s with a standard 4 pin industrial connector. Back lights come in 24 Volt DC for the industrial environment. These sturdy lights are housed in a durable industrial Delrin and aluminum enclosure. Back Lights can be strobed or continuous for the output. Available in Red, White, Blue, Green and Infrared versions. Dome Lights provide uniform illumination with no reflections or shadows. Ideal for highly reflective parts if your application requires even lighting over the area of inspection. Monster Linear Lights – Known as the bright field type of light. Lighting is aimed directly at an object, often creating distinct shadows. This type of lighting is effective when used to illuminate a large part from longer distances. Other applications include the ability to flood a large area of inspection with light. This light is a popular tool for robotic applications. Diffused Axial lights are used to create even lighting on shiny and uneven surfaces. Diffused Axial lights are built using a beam splitter to reflect the diffused light onto the field of view. The reflected light from the area of interest is then able to pass through the beam splitter into the camera lens. Because the light is on the same axis as the camera and is diffused, the image from a shiny or uneven surface will not have any hot spots or shadows. Monster Ring light – known as bright field illumination: Used for direct lighting. Light is aimed directly at an object, often creating distinct shadows. This type of lighting is effective when used on objects requiring high degrees of contrast, but creates specular reflections when used with shiny or reflective materials. For example; looking for presence or absence of “O” rings black absorbs light while the metal reflects the surface back to the camera. Spectrum Illumination’s wash down lights are great performers. Environments within the food and drug industries have proven these heavy-duty lights to be super tough. Need to strobe? Spectrum Illumination's lights have this function built in. No additional hardware needed. R.R.Floody Company is a Spectrum Illumination distributor in Northern Illinois, Iowa and Southern Wisconsin. We offer technical support to help our customers solve their applications.